The Radeon X700 is a funny old chip. ATI originally released it in 3 flavours: a high-end XT, mid-range Pro and vanilla, er, nothing. It was a hastily-released replacement for the dreadfully below-par X600, and consequently, the XT version of the X700 never even shipped to the best of our knowledge - and the X700s that did ship were woefully overpriced. However, a few months down the line and the Radeon X700 has found its feet. It's got parity of pricing with the GeForce 6600 vanilla from NVIDIA, and the performance to match. ATI are back with a native PCI-Express chip at the mid-range. 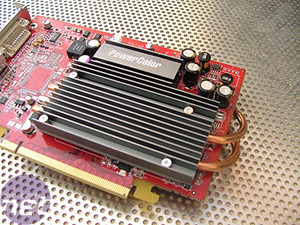 However, the stock cooling solution for the X700 is pretty horrendous, so it's with a sigh of relief that we see PowerColor come to market with a video card that is completely silent thanks to a passive cooling solution. Aimed at mid-range gamers and home-cinema enthusiasts that want a quiet media PC that still has some oomph, the Radeon X700 Bravo, as it's called, is a pretty decent card. The Bravo packs 256MB of memory, clocked at 266MHz (532MHz DDR) - it's rated to 266MHz, so not a lot of headroom there. The core is clocked at 400MHz - these speeds are a little under the X700 Pro speeds of 864MHz memory and 420MHz core. The card has 8 pixel pipelines, 6 vertex shaders, support for Shader Model 2.0b and 3Dc, just like every other Radeon X700 series video card out there. The back plate features dual-DVI and TV-Out connections, with DVI-to-VGA converters included as part of the bundle. 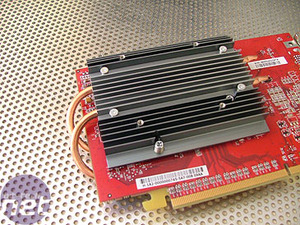 The heatpipe cooling solution looks more than a little like the Zalman heatpipe cooler. In practice it gets extraordinarily hot - it's certainly doing a great job of transferring the heat! After a hard session of gaming, we found it too hot to touch - forget messy acid, any terrorists wanting to remove their fingerprints can just leave their fingers on this for a few seconds after a few target-practice sessions in Doom 3. 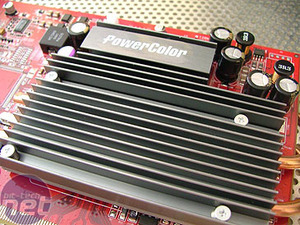 The cooler is a one-slotter, crucial for small form factor applications. We tried the card in a few different boxes, and found that it didn't unduly interfere with any other slot or heatsink, which is a relief. Since it's smaller than the Zalman passive heatsink, it should fit a little better in cramped cases. 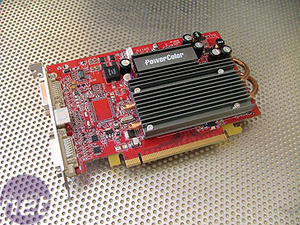 Whilst it may be nice and silent for media applications or a small form factor, you will need to think about case cooling with this card, because it could contribute an awful lot of heat to a small box. With that said, the card didn't fall over once, and there was no hint of instability in gaming or Windows use. This card comes in at just over £100, or around $149. How does if fare against it's closest competitor, the XFX GeForce 6600 Standard 128MB passive, which comes in at £10 cheaper?